Inspired by Ballard’s Scandinavian roots, Søren is focused on functionality and passion for life. Well-planned live/work, open 1br, true 1br and 2br LEED Gold inspired design provides you with a comfortable space you can feel good about. Recycling stations on every floor and LED lighting in every home assist in your efforts for lower consumption, and lower bills! Green seal carpets and low VOC paints make breathing easy. High ceilings, expansive views, and a landscaped rooftop plaza assist in your daily unwind. a unique sense of elegance and privacy. Søren was created with the utmost concern for our environment and your well-being. Sustainable materials and functional design do not compromise style. Homes adorned with natural quartz, full tile back-splashes and stainless steel appliances inspire your inner interior designer. Unique design creates semi-private entrances. Gaze out your window, or from the rooftop, at marvelous sound and mountain views. Kick back and enjoy your home. Mountain and water views from your home, modern design, and open layouts prove Soren to be your Scandinavian haven. Shed the stress of city life and streamline. 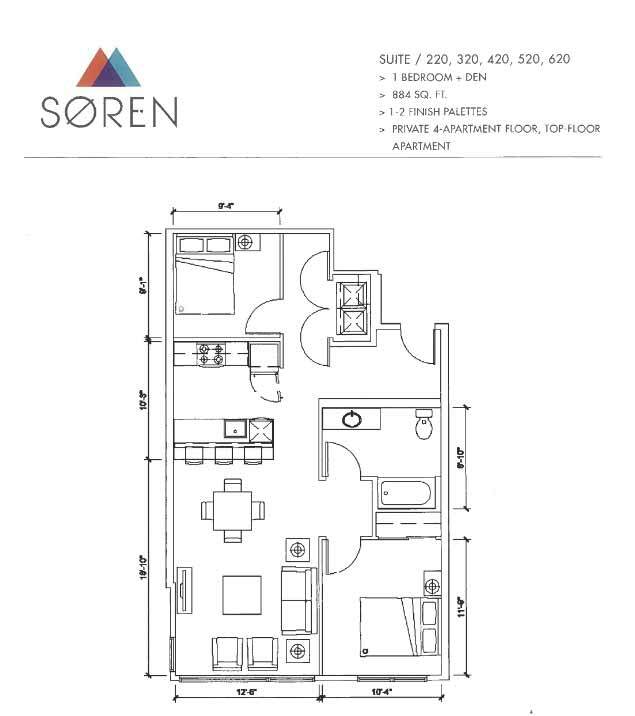 Unit 520- 1 Bedroom plus a den -884 Sq. Feet. NE facing. The best restaurants, bars, and independent retailers will spark your sense for urban adventure. With a Walk Score of 97 you can walk everywhere, or get Downtown on the streamlined RapidRide bus. Seeking more of an escape? Spend the day at one of Ballard’s many waterfront parks. Ballard Commons Park is just a half block away! One of many local urban pubs to explore. Watch the salmon run and the boats glide through the Ballard Locks. Croissants and pastries that will teleport you to Paris. Living at Søren is convenient! Serving fresh and local seafood seven days a week! Over 15 neighborhood coffee shops! The state of the art, green-built Ballard Public Library is steps away! whether it’s paying rent, requesting service or more. More On-line Services Coming Soon!